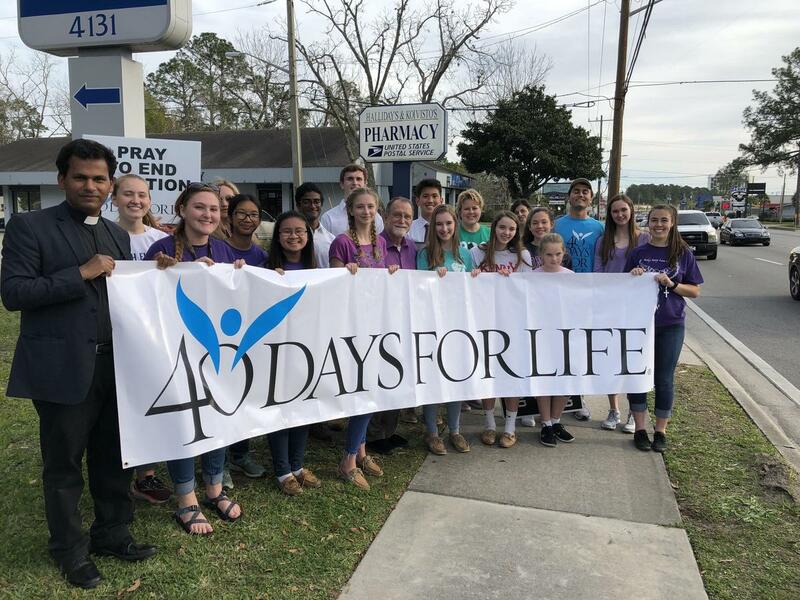 Bishop Kenny senior, Max Montana, introduced the students and faculty at BK to the 40 Days for Life; a kickoff of the Lenten season at BK. 40 Days for Life, is the largest internationally coordinated pro-life mobilized effort in history. Max is encouraging the BK community to become involved through a coordinated program of prayer, fasting, and community outreach. Max is scheduling volunteers from across the BK community to attend afternoon vigils held from 4:00 PM to 5:00 PM at A Women’s Choice of Jacksonville, 4131 University Blvd. South. The hour-long vigils will be held throughout the six weeks of Lent and are non-school sponsored. Max is a very dedicated student who challenges himself to be the best possible in and out of school. He is currently the President of the History Club, Treasurer of Student Government Association, Treasurer of National Honor Society, Treasurer of the Quill and Scroll Society, and Managing Editor of the Bishop Kenny Shield Newspaper. He has helped coach kindergarten and first graders in soccer at Assumption and has worked in the summer for Congressmen John Rutherford and for the Jacksonville Jumbo Shrimp. Max plans to major in political science and become a lawyer focused on public constitutional law with an emphasis on pro-life law.